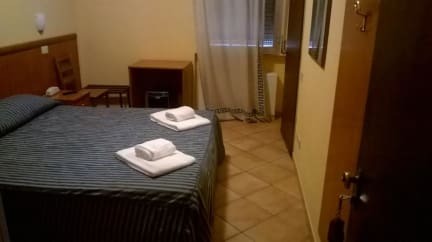 Hotel Real is located in Novoli - San Donato which is a great choice for travelers interested in old town exploring, monuments and art. The Hotel is located near three bus lines that connects the center of Florence in about 15 minutes. Hotel Real has rooms with air conditioning and a private bathroom with a hairdryer. Florence Peretola Airport is 500 m from the property. It was a bed. Shower was small and the water didn't get very warm. Very basic hotel which actually needs to be renovated. The staff was very friendly and the loation was off but with the bus it took us only 25-30 minutes to the center, so that was fine. The room however was old, smelly and the atmosphere was unforunately pretty unattractive. For one night we were fine, but if you plan to spend a bit time at your hotel I am sure you can find better deals. Nothing wrong with old hotels, but they must be kept up. Although parking is convenient, I still had to park on the street. Breakfast was good, but still very far from the main city. Good for an overnight layover, but for vacation, it’s best to stay near the city. Not a knock on the staff. They were very helpful.